Although legend has it that Japan was founded in 660BC, archaeologists agree that settlement in the Japanese archpelago dates back as far as 100,000 years. The Jomon Period (8000-c.300BC) is the earliest that has been studied. It is named after the 'jomon' or cord-marked pattern style of pottery of the period. Evidence suggests the people may have had links with South East Asia at that time. Agricultural development began in the Yayoi Period (300BC-3rd century AD), with the appearance of bronze and iron tools and ornaments. The division of labour resulting from the development of tools strengthened the ruling/subject class system. The country was made up of many small states but was unified under the Yamato clan early in the Kofun Period (c.300-710). The region known as Yamato is modern-day Nara Prefecture. The Nara Period (710-794) saw the first signs of a tangible culture and it was during this time that the first historical records were kept. The city of Nara was the capital and was considerably larger than the city of today. Under Prince Shotoku, the country acquired a constitution and a centralized Imperial state system. The culture of the Imperial court was heavily influenced by Chinese culture, which arrived via Korea and passed through the capital to the rest of the country. This included such things as weaving, metalworking, tanning and shipbuilding as well as Confucianism, medicine, astronomy and kanji, the Chinese ideographic form of writing. The main attraction for visitors to Nara today are the many temples, which were established following the arrival of Buddhism from India in the mid-6th century, again via China and Korea. In fact, it was because these temples grew too powerful for the liking of then ruler Kammu that caused him to move the capital to Kyoto in 794, the start of the Heian Period. The new capital was built using the Chinese capital as its model. Early in the Heian Period (794-1185), the Imperial court received cultural delegations from China and was further strengthened by the conquest of the north of the main island, Honshu. This was a time of great artistic development and saw the evolution of a more 'Japanese' culture. For example, scholars created two sets of phonetic alphabets or kana from the imported Chinese kanji. 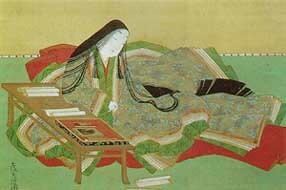 This led to the development of a uniquely Japanese style of literature ('Tale of Genji' written by Murasaki Shikibu at the beginning of the 11th century is considered the world's first ever novel). The Imperial court became very caught up in these cultural pursuits, to the extent that real control over the country passed to martial clans in the regions. After a period of corruption under the Fujiwara and later theTaira clan, who effectively ruled the country as regents, Japan entered a medieval period of feudalism and saw the advent of a samurai (warrior) class. Incidentally, this was also when the title of Shogun was first introduced, originally given to the commander of the Imperial armies. In 1185, the Minamoto clan (also known as the Genji) established military rule after destroying the Taira clan at the epic Battle of Dannoura on the Inland Sea. Minamoto Yoritomo became the first of the Shogun as we know them and ruled from Kamakura. Kyoto remained the Imperial capital but the Emperor himself was now no more than a figurehead. Under Yoritomo's Shogunate, bushido (Way of the Samurai) and an aesthetic of austerity were developed in order to maintain control over the subjegated clans. In the middle of this Kamakura Period (1185-1333), Kublai Khan's Mongols tried twice to invade the north of the southern island of Kyushu. During both attacks, the Mongol fleet was destroyed by a typhoon and this kamikaze or Wind of the Gods entered Japanese folklore. But the Shogunate failed to amply reward the military for these defeats of the invaders. The emperor Godaigo took advantage of the subsequent unrest to restore Imperial rule for a short period of time, known as the Kammu restoration. But the emperor, too, was lacking in foresight and in turn was overthrown by the Ashikaga clan and military rule restored, this time from Kyoto. This was the start of the Muromachi Period (1336-1573). The Shogun Ashikaga Takauji established two royal courts, at Kyoto and Yoshino. In Kyoto, he built the original Kinkakuji or 'Gold Pavilion'. A restored version attracts hordes of tourists to this day. As is often historically the case, Ashikaga's extravagance was accompanied by heavy taxes and corruption. Civil war between the warrior clans lasted for over a hundred years. It was during this time that Japan first experienced European culture, after a Portuguese ship ran aground in 1543. Oda Nobunaga tried to unify the country until his assasination in 1582, when his influential samurai general Toyotomi Hideyoshi took over. In 1590, following his defeat of the Hojo clan, and with the help of Tokugawa Ieyasu, Hideyoshi became the ruler of a unified Japan. He launched two unsuccessful invasions of Korea in 1592 and 1597. He is also remembered today for his crucifixion in 1597 of 26 Christians - 6 of them foreigners - in Nagasaki in an attempt to wipe out their religion, which had been introduced to Japan by Francis Xavier. A monument to the martyrs was built on the centenary of their canonization as saints in 1962. The brief Azuchi-Momoyama Period (1573-1598) is named after the castles of Nobunaga and Hideyoshi. Osaka Castle and many other castles around the country also date from this period. Meanwhile, as thanks for his support, Ieyasu received a fiefdom near the city of Edo, or modern-day Tokyo. He became the most powerful daimyo (baron) by winning the famous Battle of Sekigahara in 1600 and he became Shogun in 1603. He made Edo the new capital and Japan was finally at peace. Under the leadership of Ieyasu, the Edo Period (1600-1868) was one of great cultural achievement.